ACCA Vs CA, or both? Take your pick! ACCA or Association of Chartered Certified Accountants, is a world leading organization of accounting professionals. The qualification is well acknowledged in almost all countries of the world, and considered as their local qualification. ACCA is the best way to let employers know that you have the ability to manage all aspects of business aspects. 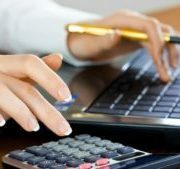 It also happens to be one of the fastest growing accounting careers in the world with over 500,000 students around 170 countries. 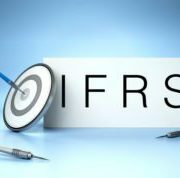 When we think of a rewarding career in accountancy in India, Chartered Accountancy is the first thing that comes to our mind. For the longest time, there was no contender for this qualification in India. However, the emergence of global accounting degrees and growing awareness have brought into light new age global qualifications like the ACCA. While CA is undoubtedly the most coveted degree in India, many aspirants seem discouraged by its low passing rates and limited recognition in the global arena. This is the reason students and young professionals are now also considering ACCA as an accounting qualification. However, you need not always have to make a difficult choice, you can have the best of both worlds too! Pursuing Association of Chartered Certified Accountants after CA also has a number of benefits and gives you an edge over other candidates. 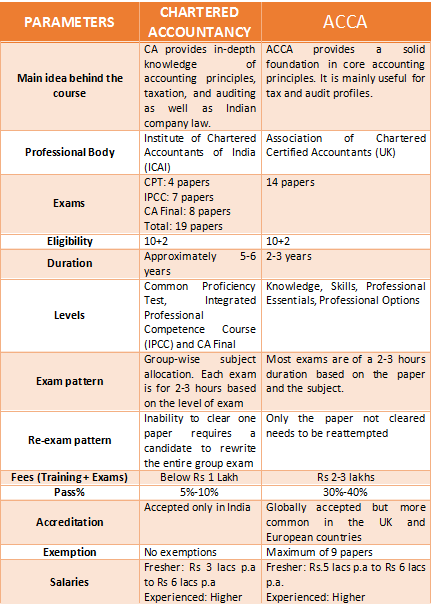 Global recognition – Indian CAs who want to brace themselves for a global recognition can opt for ACCA. This gives candidates an opportunity to work in diverse roles such as financial advisory, analysis, treasury etc. in top MNCs. Additionally, a candidate can also apply for opportunities abroad if he is qualified as an ACCA. Flexibility – As an Indian CA, you will get an exemption of all 9 papers, which means you need to appear for only 5 papers (professional level) of The ACCA Qualification to obtain the membership. 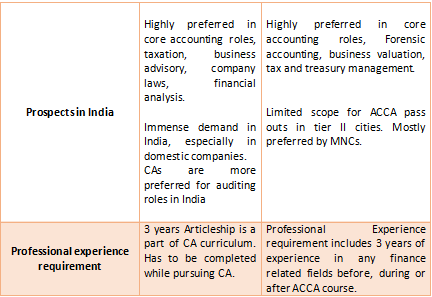 Also, the CA articleship is counted as the Practical Experience Requirement (PER) for ACCA. Exam pattern – Exam pattern is quite flexible as compared to that of Indian CA and is not held in groups. When appearing for ACCA exams, you will only need to appear only for the modules you haven’t cleared and not the entire group. 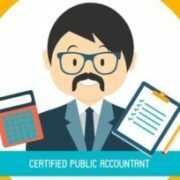 Career Goals: If you are looking at a global career you can opt for ACCA, but if you want to pursue a career in domestic or public sector companies, especially in taxation and auditing, Chartered Accountancy is more suitable for you. Please note that presently in India, ACCA members who aren’t Chartered Accountants, do not have the authority to sign the books of accounts as an Auditor. They can work in Audit teams though. The authority to sign is still statutorily reserved for members of the ICAI. The flexibility of the curriculum: Another factor that could impact your choice of qualification is the degree of flexibility that each of them offers as well as your comfort level with the structure of the course and exam pattern. Time commitment: While passing the CA papers takes quite a few years due to its difficulty level and re-examination pattern, ACCA can be completed in 2-3 years. So if you have time constraints and do not want to wait too long before starting your career, you can opt for ACCA. Click here for more information about the ACCA course: http://www.proschoolonline.com/acca-course. 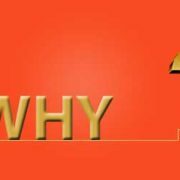 https://www.proschoolonline.com/wp-content/uploads/2017/12/confused-girl.png 333 500 Namrata Sen Chanda https://www.proschoolonline.com/wp-content/uploads/2018/03/proschoolonline-logo.jpg Namrata Sen Chanda2017-12-27 12:56:142019-04-11 12:03:47ACCA Vs CA, or both? Take your pick! Why should one do a DipIFRS? 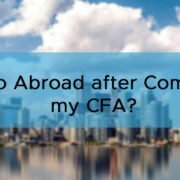 Can I go abroad after completing CFA® Program ? 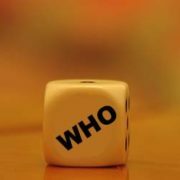 Who should do an ACCA? Accounting Jobs are Boring. Says Who?